Keeping the balance between artistic, scientific and educational work represents Johannes Monno's central concern. His deep interest in the instruments and the style of the different epochs resulted in five CD productions and various publications. 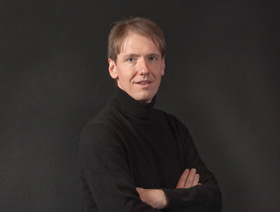 In addition to chamber music projects with artists such as Wilfried Jochens, Ingo Goritzki, Olaf Van Gonnissen, Thomas Muller Pering, Kolja Lessing, the ensemble Rilegato and the Trio Gremonda, Johannes Monno has attracted attention by repeatedly performing fine solo concerts focussing on thematically well-chosen programs. He has held a professorship at the University of Music and Performing Arts in Stuttgart since 2004. He is the founder and artistic director of SICG Festival. 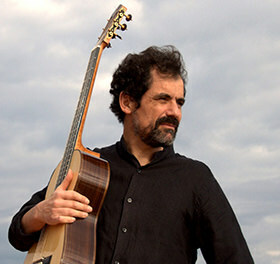 This year, Catalan guitarist Àlex Garrobé is playing the opening concert. 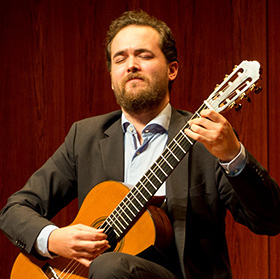 A first prize in the most important guitar competition Fundación Guerrero Guitar was followed by an impressive worldwide concert career with stations in all major concert halls such as the Concertgebouw in Amsterdam, Radio France Auditorium in Paris, Auditorio Nacional (Madrid), Palau de la Música Catalana (Barcelona) or the Lutowslasky Auditorium (Warsaw). His close collaboration with composers such as Salvador Brotons results in world premieres and works dedicated to him. Àlex Garrobé holds a Doctorate in Art and Music History from the Universitat Autònoma de Barcelona. 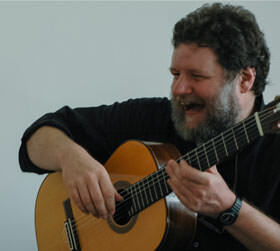 He is currently teaching at the Escola Superior de Música de Catalunya (Barcelona). So far he has published 8 CDs with Harmonia Mundi, Naxos, Opera Tres, Columna Música and J.S. Records. József Eötvös graduated at the Franz Liszt College of Music in Weimar as the student of Roland Zimmer and studied the art of composing from Franz Just. He regularly gives concerts in several countries of the world: he has played, among others, in Austria , the Czech Republic, Greece, the Netherlands, Poland, Lithuania, Germany, Romania, Switzerland, Sweden, Slovakia, Lichtenstein, Japan and Singapore. He is invited to perform both solo concerts and orchestral concertos. He has made radio and television recordings both in his home land and abroad. His arrangements are musical curiosities which are played on this instrument only by him in the whole wide world. His arrangement of Bach's Goldberg Variations is regarded by critics as the arrangement of the century. Following this success, he produced other arrangements as well, such as Bach's lute works (Chanterelle), Chopin's piano pieces 1 - 2 (Professional Music Press - Poland and Gendai Guitar - Japan ), Brahms's 21 Hungarian Dances (MelBay) and J. S. Bach The Art of Fugue. Born in Tiengen / Upper Rhine Olaf Van Gonnissen already received violin lessons at the age of four and switched to the guitar when he was eight. He became famous for his concert career with the "Frankfurt guitar duo". Olaf Van Gonnissen began his pedagogical work in 1974 with a teaching position at the Academy of Music in Darmstadt. 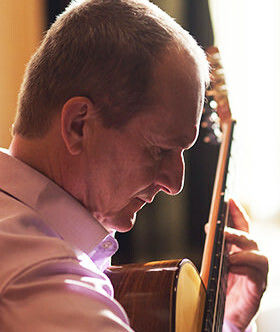 Since 1977 he has been teaching the guitar at the University of Music and Performing Arts in Frankfurt am Main and since 1999 he has held a professorship at the University of Music and Theatre in Hamburg. He is a member of the "Mutare Ensemble Frankfurt", of "Rilegato" and regularly performs with Gertrud Weyhofen. Van Gonnissen is a lecturer at various festivals and juror at international competitions as well as co-editor of the new Karl Scheit guitar edition UE. His special interest lies in the performance practice of early music. He performs his solo concerts on historical instruments such as the lute, vihuela and baroque guitar. Peter Graneis studied as a junior student at the University of Music in Stuttgart and also completed his bachelor's degree in Prof. Johannes Monno`s class. He was a finalist and winner of several international competitions. As a scholarship holder of the DAAD, he continued his studies with Zoran Duki? at the Escola Superior de Música de Catalunya (Barcelona) and Den Haag. In 2017 his debut CD "Portrait" was released. Tillmann Reinbeck began playing the guitar at the age of eight. He studied at the State Academy of Music in Trossingen, as well as with Jose Tomás in Alicante (Spain). In 2003, he completed with honors his graduate recital at the Musikhochschule in Hamburg, where he studied with Olaf Van Gonnissen. In 1997 he received the first prize at the International Guitar Competition in Zarautz / San Sebastian (Spain). In 2002, the critically acclaimed CD "Invocación y Danza" appeared at Acoustic Music Records. 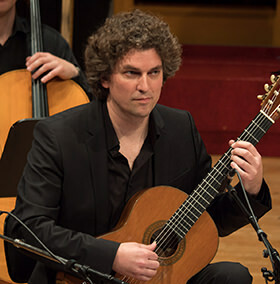 Since 2005, Tillmann Reinbeck has been a lecturer of the guitar at the national schools of music in Stuttgart and Trossingen. He is a competent and conscientious teacher, active as a soloist and a member of innovative chamber music projects, such as the "Aleph Guitar Quartet". This year Tillmann Reinbeck was appointed professor at the State University of Music and the Performing Arts Stuttgart. 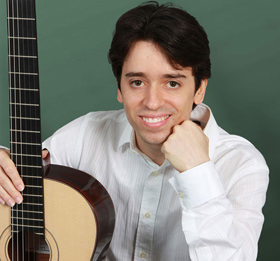 Mateus Dela Fonte is the winner of numerous guitar competitions. He studied in Salvador (Brazil), Barcelona, Madrid and Stuttgart, among others with Mario Ulloa, Àlex Garrobé and Johannes Monno. Concerts have taken him to various countries in Europe and Latin America. As a soloist, chamber musician, lecturer and juror he was a guest at festivals such as the International Guitar Festival Mikulov (Czech Republic), the International Guitar Festival Balatonfured (Hungary) and the International Guitar Festival Guitar Mania (Portugal). His second CD "Paisagem Brasileira - Brazilian Landscape" was released in 2013 and is the music of his homeland - it is particularly dedicated to the Brazilian 'Choro'. Part of the CD was recorded as a duo with Vítor Diniz. In the winter semester 2013/14 Mateus Dela Fonte received a teaching position with focus on chamber music at the University of Music and Performing Arts in Stuttgart. Katrin Klingeberg began her studies as a junior student at the Musikhochschule Stuttgart with Ihsan Turnagöl and then continued her studies at the Musikhochschulen Hannover, Lucerne and Weimar. Most recently, she studied in the concert class of Prof. Thomas Müller-Pering at the Franz Liszt Conservatory in Weimar and completed her concert exam in 2014. At the same time, she completed a master's degree and subsequent concert exam in chamber music together with her partner Sebastián Montes with the renowned Kaltchev Guitar Duo at the University of Music and Performing Arts Stuttgart. After numerous first prizes in international competitions, the guitar duo Klingeberg-Montes is one of the most sought-after guitar duos in the international guitar scene. Katrin Klingeberg has performed successfully in many countries in Europe and South America, as well as in Japan and the USA and is regularly invited as a lecturer in the context of master classes and as a jury member to festivals and competitions. 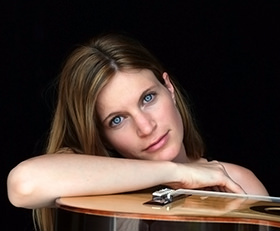 Since 2015 Katrin Klingeberg and Sebastián Montes have been the artistic directors of the Nürtingen International Guitar Festival, one of the most important guitar festivals in Europe. Since the summer semester 2016 Katrin Klingeberg has been teaching at the Musikhochschule Stuttgart. The luthier couple Margarete Brunswicker and Christian Apelt have been running an independent master workshop in Frankfurt since 1989. They have planned and carried out their apprenticeship as guitar builders together - that has shaped the concept: In addition to the techings of their teacher Gerold Karl Hannabach they feel attached to the Spanish tradition, which they got to know on numerous Hospitationsreisen to Spanish luthiers.